Our installers have the expertise required to make sure your home looks great and every piece provides the function it was intended to. Above All’s professional installers understand the importance of both the functional and aesthetic aspects of these exterior trim items. They have the expertise required to make sure your home looks great and every piece provides the function it was intended to. Our pre-finished aluminum soffit is available in vented and non-vented sections. Vented sections of soffit provide critical air flow from your eaves into your attic. This air flow is an important part of your roof’s ventilation system. It assists moisture and heat to flow upwards towards your roof vents and out of the house. The fascia of your home is the trim board that hangs down from the edge of your roof line. 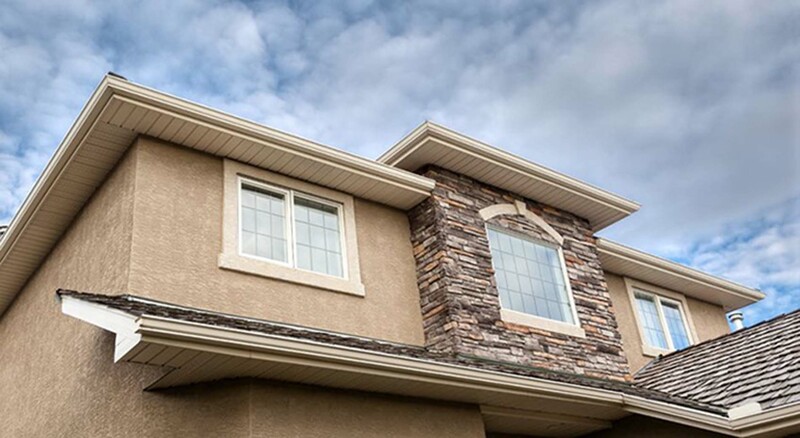 Installing pre-finished fascia and soffit materials on your home eliminates the ladder-top maintenance required by wood fascia and soffit treatments. The pre-finished aluminum fascia is installed over the wood trim board to protect it from the elements and give you a finished trim around your roof edge. We can also custom make fascia cladding to fit any profile. If you’d like more information on any of our soffit, fascia or eavestrough products, please contact one of our advisors to set up a consultation and receive a free estimate on your project.